Fireplace Doors Online is proud to have the years of hands on experience and knowledge of fireplaces that we do. Safely operating your fireplace depends greatly on having the proper equipment. When ordering a door for your fireplace, one of the first questions we ask is if you have a zero-clearance fireplace. A zero-clearance fireplace is a pre-fabricated fireplace made in a factory and is purchased as a whole unit. These are typically installed with little to no clearance to the components of your home such as the walls, studs, and mantel. These fireplaces feature louvers (slots that allow ventilation for your fireplace) above as well as below the fireplace to allow air to flow around the outside of the firebox itself which insulates it and prevents it from burning the materials that surround the fireplace. Doors for a zero-clearance fireplace should have gaps in them to help with the cooling effect necessary for safely operating the unit. So why shouldn’t you use masonry fireplace doors? Masonry fireplace doors are not made with these gaps that are necessary for zero clearance fireplaces, and therefore must NEVER be installed. Masonry doors fit on the outside of your fireplace and if forced onto a Zero Clearance fireplace, will cover some of the louvers. Covering the louvers is very dangerous because the fire could become so hot that it shatters the glass in the doors. It could also get too hot for the area surrounding the fireplace and cause major damage to your walls, scorching the studs, and even starting a house fire. Unfortunately, if you are purchasing your fireplace from a big box retailer, they may not have knowledgeable staff on hand and will sell you a masonry door for your zero-clearance fireplace. Fireplace doors online have a knowledgeable staff ready to assist you with the purchase of any materials and accessories for your fireplace, no matter what type you have. You can find a large selection of doors for your zero clearance fireplace here! The exterior of the Fireplace: visually inspect the chimney from the outside and any parts of the chimney you can see from the inside of your home. Look for chips in the bricks, masonry joints, cracks or holes in the chimney walls and any corrosion, stains or loose sections. If the chimney is exposed in the attic it is very important that you inspect this portion as well. If you find any of these issues, they should be repaired immediately. Chimney Caps: A properly installed and well-maintained chimney cap can reduce damage to the chimney which is caused by water and wildlife. If moisture enters the chimney it can freeze and thaw which subsequently causes expansion damage to the chimney walls. Wildlife entering the chimney can create clogs from nests or other debris as well as introduce fleas, ticks, worms, and disease-causing pests to your home. Signs of Leaks: On the interior of your home, check for leaks in the chimney by the search for stains or damp areas. Stains and dampness are caused by faulty flashing. The flashing goes around the base of the chimney at the roofline and if not properly sealed can leak. You should also inspect the flue liner as well. If this is damaged, you will see signs of water around your chimney you should have your chimney repaired immediately. Thoroughly Inspect the Flue: You can do this by opening the cleanout door which is typically located at the base of the flue either in the basement of your home or the outside of the house itself. Look up inside the flue using a small flashlight and a mirror. Checks for signs of a buildup of soot as well as any cracks, holes or any separations that may be happening. If you see anything concerning, contact a chimney professional for an inspection and schedule a cleaning. Inspect the Fireplace Itself: Check the masonry work of the fireplace for signs of wear and damage. As your home ages, it begins to settle on its foundation. This can cause cracks in the brickwork that should be repaired. 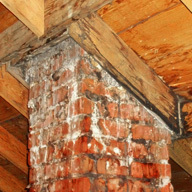 The masonry work of your fireplace can also present signs that your foundation is giving way. Check the damper to ensure it opens and closes properly and easily. Inspect the smoke chamber above the damper for signs of a buildup of soot. The safety of your fireplace should always be a top priority in your home. When installing any new accessories such as doors, it is extremely important to ensure you are using the right materials designed specifically for your fireplace. Performing any upgrades to your fireplace is the perfect time to do any inspections on your fireplace and chimney. If you are ever in doubt as to what products can be used on your particular fireplace you can contact Fireplace Doors Online. Our knowledgeable staff is here to help you with all your fireplace needs. Your safety is important to use. No matter what type of fireplace you have whether it be a gas fireplace, electric fireplace, or wood burning fireplace, we have everything you need to keep it functioning at its best and your home looking great. Give us a call today to learn more about the products available for your fireplace. You’ll be amazed at the results!